Great scarf! Love the print! What a fabulous look! Love the red! Amazing Tom Ford shades. Clearly your wining with this outfit. Thanks for sharing and Happy Holidays! Nothing beats this scarf, right?! I love it with your gorgeous red coat! So festive! 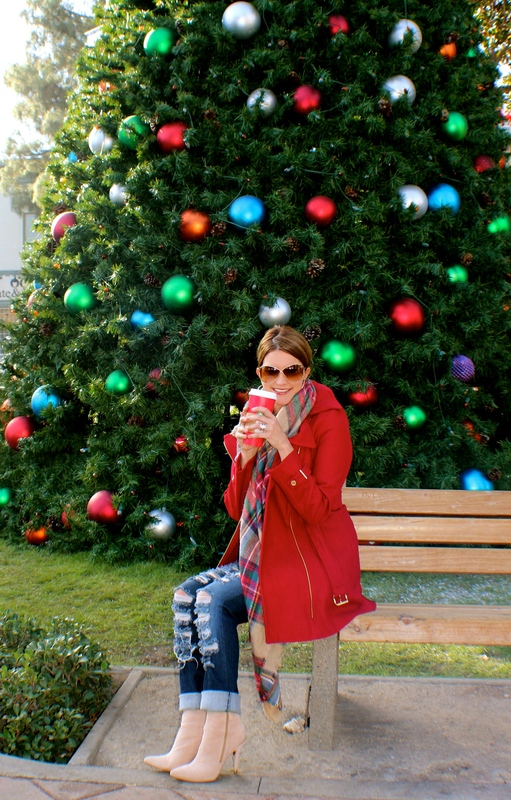 This whole look is Christmas perfection! Love your style as usual! Beautiful outfit! That scarf and coat are lovely! I have literally been living in my blanket scarf! You look so cozy such a fun look! I love everything about this outfit! That denim is so cool and i love that red coat! You look awesome! I would definitely wear a look similar to this one! Eeeek! 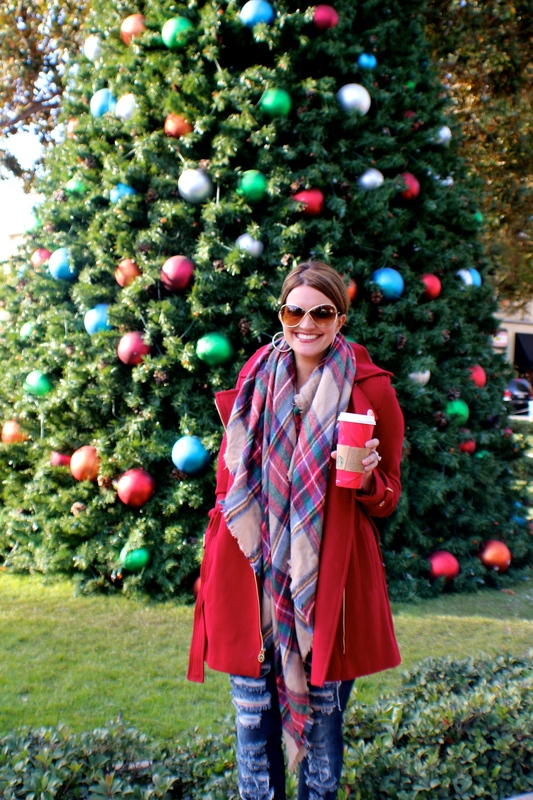 I love this look –the scarf, the red coat, the booties. The Christmas tree makes it perfection! 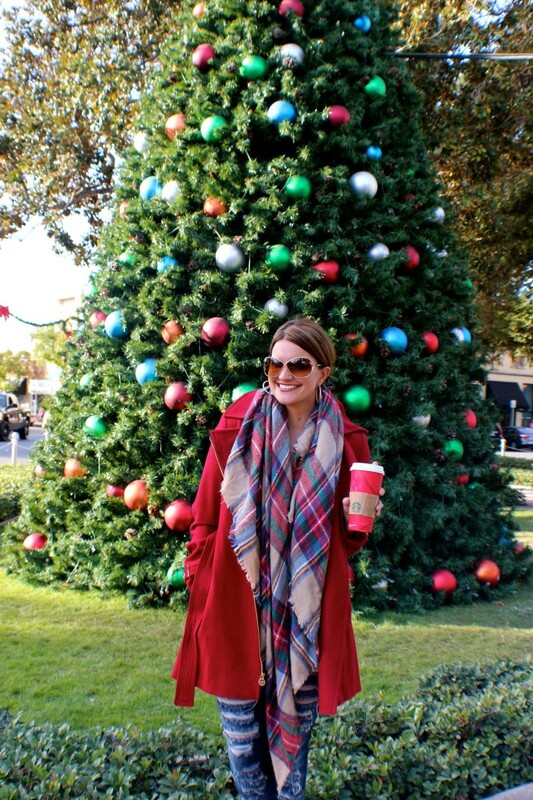 LOVING your MK coat! You look like this post was a blast! You look ready for the holidays for sure! I looked at that scarf in Zarabut left it too late to buy! It goes so well with your gorgeous striking red MK coat. Even the jeans look so fabulous with it. Love the Christmas tree in the background too. Thi red coat is beyond gorgeous and I LOVE your booties! You look gorgeous! Red is definitely the color of the season! I love a red coat, it’s such a fun, bright alternative to black. Those booties are perfect – way to go Charlotte Russe! I love this outfit! You are so pretty and love your scarf! 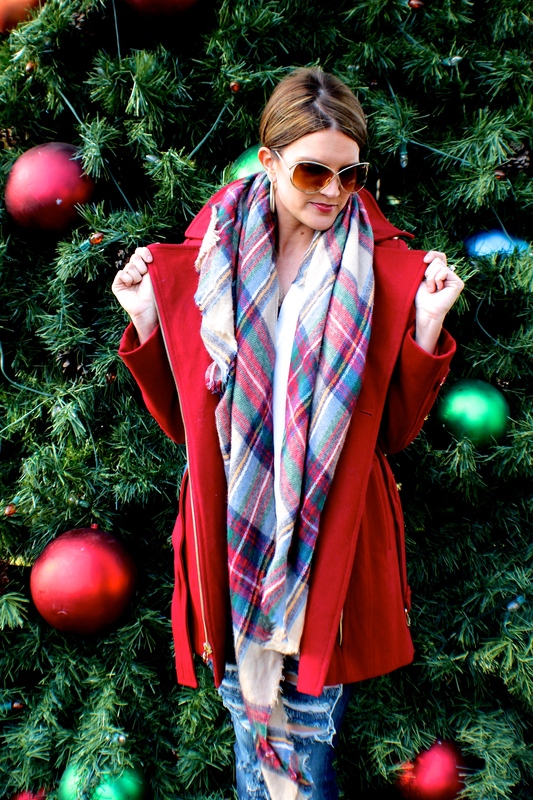 This is the perfect Christmas look! You look adorable Shauna! Looking pretty glamorous doll! Love it! You look absolutely adorable! That tree is beautiful too! Okay, everyone has this scarf, and I want it so bad! It looks amazing on you! LOOOVE this outfit! You look amazing! That red coat is absolutely amazing! I love the bold color on it. And you are right, it definitely says holiday! Love it paired with the scarf and those jeans. Also, loving your hair! Love your coat. It looks perfect with your printed scarf. The the combination of the scarf with coat. So festive!